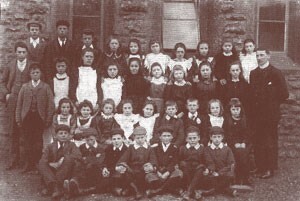 The oldest of our school buildings was opened as the village school on Easter Monday in 1856, although a school had existed in the village for many years before that (probably from the 1730s). What we call "the new building" was opened in July 1966, the same month England won the football World Cup. These days the 1856 building is home to two classes, the new building is home to a further two classes, our school hall, office,library, staff room, kitchen and storage areas. In July 1967 our swimming pool was opened and thanks to the efforts of the PTA is still in good condition. We have one timber-frame classroom next to the pool. In 2007, members of the PTA built an outdoor classroom for the school and this is a very popular place when the weather is good. In Summer 2011, the new library was built off of the main hall with a quiet reflection/storytelling area added to the external orchard area.